Now is the time to take action in the Central African Republic (CAR). A human rights crisis of epic proportions is currently taking place in the Central African Republic. Since early January 2014, “ethnic cleansing” of Muslims has been carried out in the western part of the CAR. This is the most populated area of CAR. Entire Muslim communities have been forced to flee, and the hundreds of Muslim civilians that haven’t been able to escape have been killed by militias known as ‘anti-balaka’. There has been a larger tragedy unfolding in CAR over the years. It was in March of 2013 that the mostly Muslim ‘Seleka’ coalition seized power, and since then there has been growing violence, much of it against members of the Christian community. The Seleka left power in mid-January 2014, after killing thousands of Christian civilians, and looting and burning their homes. Many Christians in turn attributed responsibility for the Seleka’s abuses to CAR’s minority Muslim community as a whole, and this spurred the development of the predominantly Christian anti-balaka militias that are now taking part in the “ethnic cleansing”. There is a way we can help the innocent civilians caught up in the tragedy unfolding in CAR. On 10 April 2014, the United Nations Security Council (UNSC) unanimously adopted Resolution 2149 authorising the establishment of a new peacekeeping mission for the Central African Republic. This is the first important step towards ending the crisis in CAR. Amnesty International is organising to petition President Barack Obama to call on him to take action. By joining with Amnesty International and signing the petition, you can do your part to urge the international community to implement effective short-term measures immediately, to deploy a strong UN Peacekeeping operation by 15 September, and to ensure that the current peacekeeping forces present in CAR are meaningfully supported to protect civilians in the meantime.. The Wishing Well operates ethically, effectively and empathically with a view to achieving quality outcomes and a satisfying working environment, and as such we support such organisations as Amnesty Internation, as they encompass similar ideals. The 15th of March marked the three year anniversary of the conflict in Syria, which shows little sign of abating. The Syrian War – how did it start? The Syrian civil war, or the Syrian uprising, is an ongoing armed conflict in Syria between forces loyal to the Syrian Ba’ath Party government and those seeking to oust it. The conflict appears to have begun early 2011, with popular demonstrations that grew nationwide by April 2011. 9 million Syrians have been forced to flee their homes and find shelter away from the devastating violence, including as refugees in neighbouring countries. Washington Post has compiled three grim statistics on the impact that the Syrian conflict has on the Syrian people, on what unfolds on average each day that it continues, using figures taken from last year. Every minute: Three Syrians become refugees abroad. Some 2.5 million people have sought refuge outside the country, according to the United Nations. About 1.5 million of those fled in the past year – a staggering 4,110 a day. Syria’s neighbours are poorly equipped to deal with the influx, and humanitarian agencies face huge funding shortfalls. Every two minutes: Eight children inside Syria are forced to flee their homes. The number of displaced children in Syria has more than tripled over the past year, from 920,000 to nearly 3 million, according to UNICEF. In its latest report, the agency warned of a lost generation as many struggle to find food, access health care or psychological support, and go without schooling. Every 10 minutes: One person dies. More than 146,000 people have been killed, according to the Syrian Observatory for Human Rights, an opposition group that tracks the death toll. Over the past year deaths have averaged more than 170 a day, it says. The United Nations has given up counting. The war dead in just three years is in line with the number estimated killed in 15 years of civil war in Lebanon. As the anniversary approached, Oxfam researchers surveyed 151 households of refugees in three areas of Jordan representing 1,015 people. What these surveyed showed was that the overwhelming majority of refugees want to return to Syria. Only a third of those questioned said they could see themselves returning home, and of these refugees, 78 per cent said they did not know when this would be. With the conflict in its fourth year, it is now more important than ever to help end the crisis. Oxfam, in a joint campaign with Act for Peace, Adventist Relief and Development Agency, Amnesty International, CARE, Caritas, Save the Children and World Vision Australia, are taking the message to Australia’s leaders, Julie Bishop MP, Joe Hockey MP, Bill Shorten MP, Tanya Plibersek MP and Senator Christine Milne, to stand with Syria and compel them do all they can to end the appalling suffering. The Wishing Well operates ethically, effectively and empathically with a view to achieving quality outcomes and a satisfying working environment, and as such we support such organisations as Oxfam, as they encompass similar ideals. In October, 2013, the World Society for the Protection of Animals launched their campaign, Protect This Bear, to protect bears around the world, with the immediate focus on tackling the bear bile industry. Across East and South East Asia, thousands of bears are being held in captive in the bile industry. These bears are held in captivity to harvest bile, a digestive juice produced by the liver and stored in the gall bladder. Bile is a valuable commodity in these countries, and is used in some traditional medicine as well as new non-traditional cosmetic and lifestyle products. The bears are trapped in tiny cages throughout the bile extraction process. A hole is repeatedly punched through the bear’s skin and the bile is extracted from their gall bladder, an extremely painful process for the bears. “To their owners the bears are nameless money machines. They don’t see their personality or care about their pain. I believe bears deserve better.” – Luke Nicholson, Project Manager for Bears in the Wild, WSPA Asia-Pacific. WSPA’s campaign aims to expose the cruelty of the bear bile industry, and to work towards making sure that their vision is realised: of all wild animals being protected in the wild, not used, abused, farmed or sold. Since 2005, WSPA’s work has helped reduce, by half, the number of bears kept in cruel bear bile facilities in Vietnam. WSPA’s vision is a world where animal welfare matters and animal cruelty has ended. They work directly with animals and with the people and organisations that can ensure animals are treated with respect and compassion. The Wishing Well operates ethically, effectively and empathically with a view to achieving quality outcomes and a satisfying working environment, and as such we support such organisations as WSPA, as they encompass similar ideals. 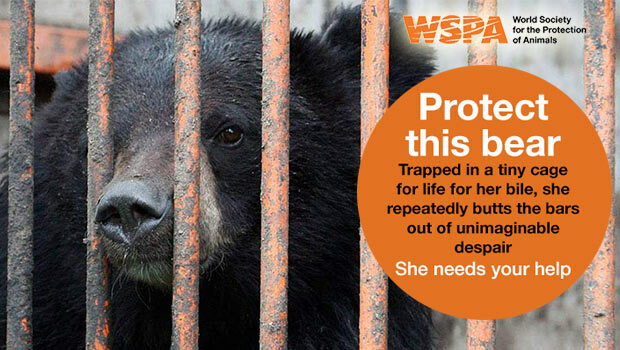 You can help bring a halt to the bear bile industry by supporting WSPA’s campaign, Protect This Bear. All funds raised go towards all of WSPA’s work to prevent animal cruelty around the world, including the protection of bears. The Avaaz campaign to stop the eviction of Africa’s famous Maasai tribe from their land has paid off! Government officials in Tanzania had planned to annex 1,500 sq km bordering the Serengeti national park for a “wildlife corridor” that would benefit a luxury hunting and safari company based in the United Arab Emirates. This would have resulted in the eviction of over 40,000 Masai pastoralists from their ancestral land to make way for this big game hunting reserve for Dubai’s royal family. This controversial action has been attempted before — the last time this same corporation pushed the Maasai off their land to make way for rich hunters, people were beaten by the police, their homes were burnt to a cinder and their livestock died of starvation. But when a press controversy followed, Tanzanian President Kikwete reversed course and returned the Maasai to their land. This time round, Avaaz took action to create the media controversy that the Maasai needed. Now, after 18 months of co-ordinated protests that included a global petition signed by more than 1.7 million people, Avaaz and their activists claim victory! The ‘Stop the Serengeti Sell-off’ petition attracted over $1.7 million signatures and led to targeted email and Twitter protests. Avaaz rallied the international media, getting CNN and Al Jazeera to visit the area and break the story to the world, and Avaaz members funded hard-hitting adverts in local papers calling out the government. Finally, in late September, the Tanzanian Prime Minister visited the area and told the Maasai that the President had confirmed that they would not be evicted. The Wishing Well operates ethically, effectively and empathically with a view to achieving quality outcomes and a satisfying working environment, and as such we support such organisations as Avaaz as they encompass similar ideals. How can you support Avaaz?